NEW ORLEANS – The New Orleans Gators have signed guards Dakota Gonzalez and Dylan Gonzalez, team owner Percy Miller aka Master P announced today. Per GMGB league policy, contract details were not disclosed. Cox Pavilion showdown professional co-ed basketball played at its highest level. 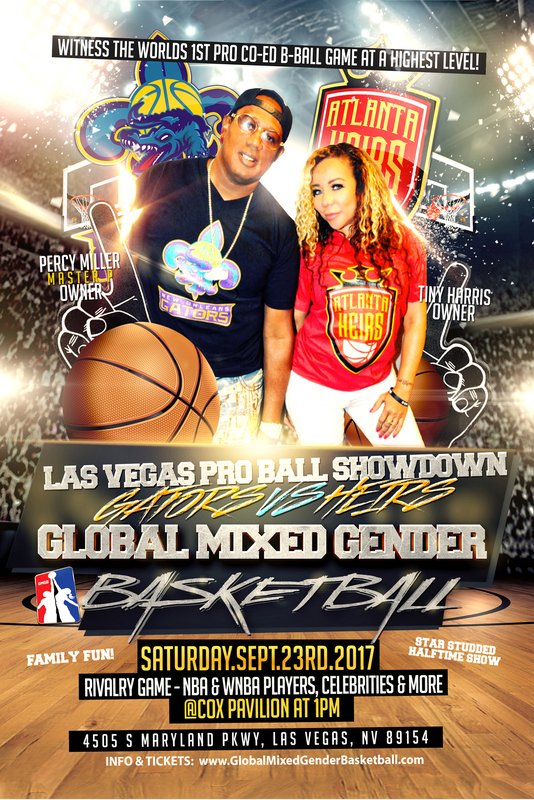 Tiny Tameka Harris, owner of the Atlanta Heirs rivalry game vs Percy Miller aka Master P, owner of the New Orleans Gators. Both teams loaded with WNBA & NBA players, a night filled with action packed competition including a star studded halftime show hosted by the Breakfast Club: Charlamagne, DJ Envy and Angela Yee. Witness history as NBA & WNBA players compete on the same floor at the same time. Celebrity coaches and owners, will be in the Cox Pavilion competing to win, fun family entertainment at its best. There will be a co-ed 3-point contest and co-ed dunk competition. CEO of the GMGB, Mr. James Harris announced at the Philips Arena in Atlanta on Thursday, August 17th that the New Orleans Gators and the Atlanta Heirs will face off in an exhibition game in Las Vegas, Nevada on September 23rd 2017 at 1pm. Many business people and celebrities have their eyes on the new professional basketball franchise in New Orleans. But today, Percy Miller was able to close the deal with the GMGB organization. Mr. Miller was born and raised in New Orleans and basketball has been a passion of his since childhood. Owning the New Orleans Gators is a great fit for him and the City, bringing family entertainment and basketball together in one arena is exciting for the community. Putting professional men and women athletes on the basketball court at one time is unique. And giving women equal pay as the men will even the playing field in the Global Mixed Gender Basketball League. Percy Miller, the New Orleans Gators owner, businessman entrepreneur and philanthropist has appeared in numerous financial publications, including Forbes. A fervent basketball player, he has played professional basketball himself. As a team owner, he is about giving back to his community and has made Team Hope NOLA the foundation for the New Orleans Gators franchise.